I owe this idea 100% to my friend & neighbor. She asked me if I could create a baby gift for a child whose house was divided- one parent a Steelers fan, the other a Patriots fan. 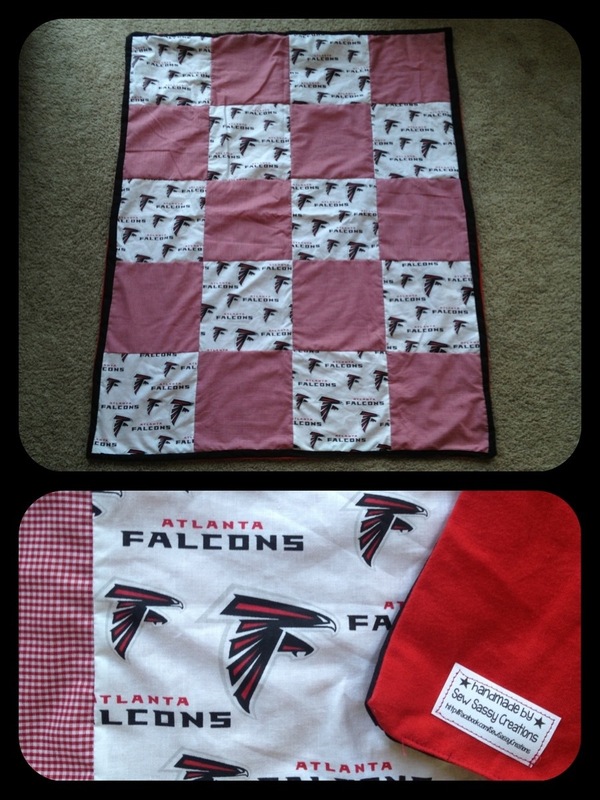 Because quilts are my favorite thing, I had a vision for a checkerboard pattern blanket, using fabric from both teams. I placed the order for the fabric and couldn’t wait for it to arrive. In the mean time, I was at Hobby Lobby (for what, I’m not even sure), and browsed through the fabrics. I saw they had Atlanta Falcons fabric, and got an idea. My best friend and her husband are Falcons season ticket holders. Their daughter was turning 1, and I needed a birthday gift. I bought the fabric along with red gingham and red flannel to back the blanket, went home and got straight to work. 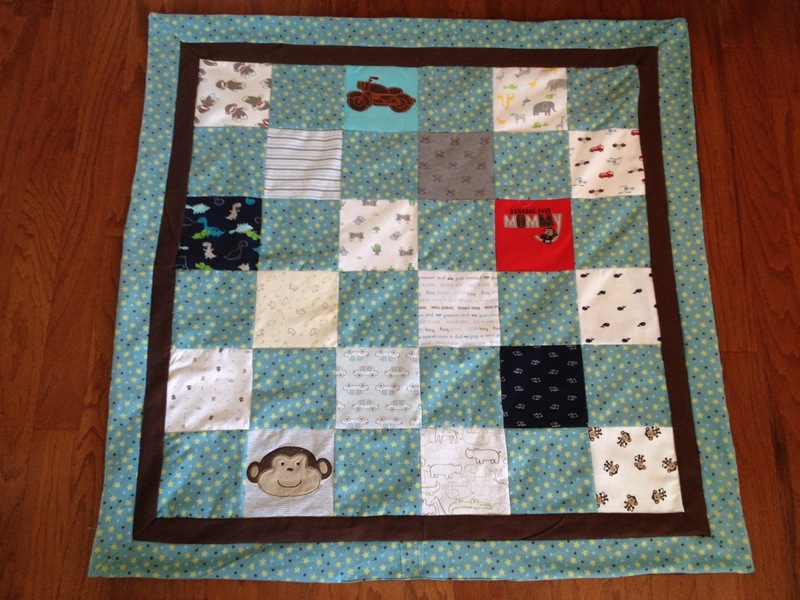 The small blanket measures 36″ by 42″, and sells for $30, the larger blanket is 42″ by 42, and is $40. These can be created for any college or professional sports team, and are a great way to show your team spirit, or a house divided! Check out my Facebook page for ordering information. 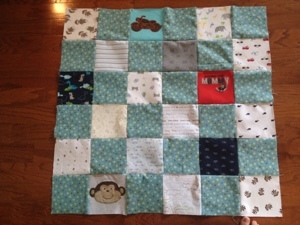 This quilt used 18 squares made from onesies and sleepers, and 18 flannel squares. The blanket is backed with flannel fabric, and measures 40″ by 40″. I charge $100 for a blanket this size. Like all of my creations, it’s custom made for you. Visit me on Facebook for more info! Yesterday I ordered labels to sew onto murchandise, and today I ordered business cards. Check our the new logo! I’ve done quilts and projects for friends throughout the years, so I am not quite sure why this has me so excited. My neighbor “liked” my facebook page and emailed asking if I could make a custom piece for a friend. 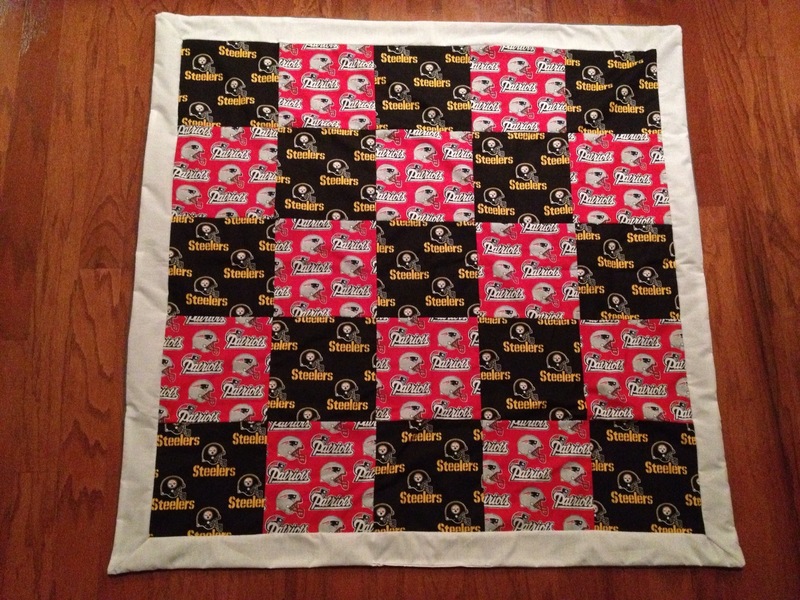 One parent is a Steelers fan, and the other a Patriots fan, and she wanted a gift for their baby to show their “house divided”. 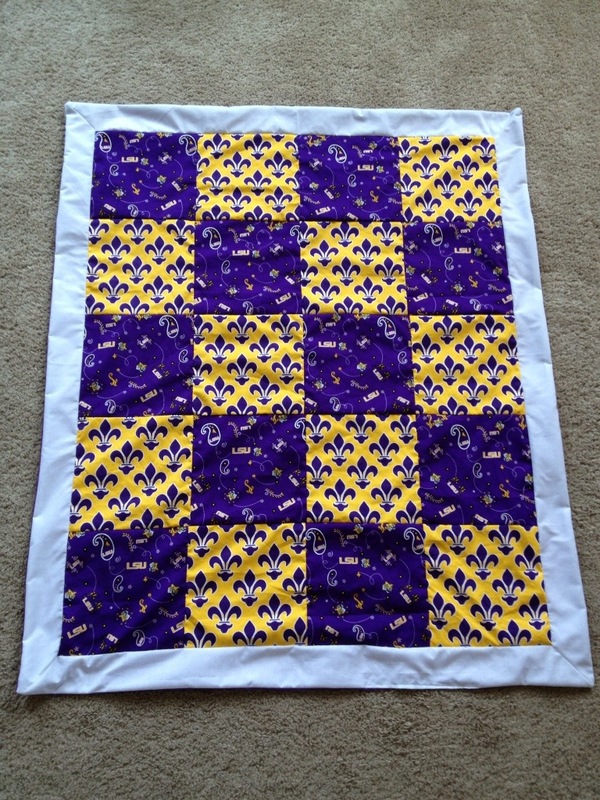 I ordered fabric this morning to make a checkerboard pattern quilt using NFL fabric for each team. I can’t wait to get started.